Nestled in the hills of Perry County, Clay Haus owner Betty Snider looks after her guests. Betty's son, Scott, acts as chef and manager. The family affair is completed by Betty's grandson, Chris Riffle, assisting in the preparation of your homemade meal. Betty is an amazing lady; married at 16, then after a number of children went back to high school at 30 to get her diploma. She continued on to college while raising six children. She left a teaching career in 1979 to renovate an old home into a restaurant, now known as Clay Haus. 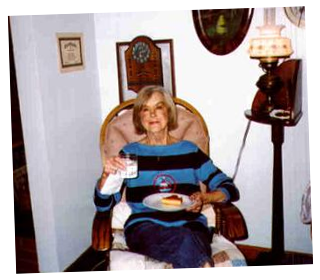 To the right, a picture of Betty and a once well known name in Central Ohio, Bill Pepper. Bill stopped at Clay Haus for dinner while passing through Somerset. Somerset is located on heavily traveled State Route 22. 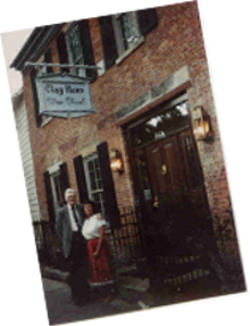 For this reason, Clay Haus has hosted many guests who were "just passing through", looking for a good meal and a place to relax, before returning to the road. Come in, relax, let your mind drift. You may hear the covered wagon stopping at our door to enjoy the best offerings of the comforts of home, relaxation to the weary traveler!